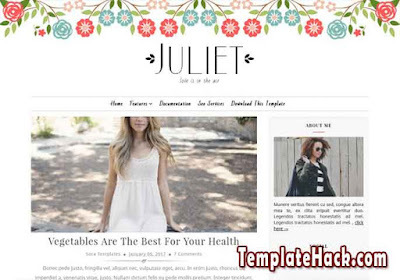 TemplateHack.com - Download Juliet premium blogger template. Juliet is unique fashion blogger template. This template made with a unique design, look at the top of page, this template has a beautiful flower design to make this blog look cuties. Juliet is made for girly blogger to share their activity photo to their travel blog, fashion blog, dresses blog, jewelry blog, make up blog, model blog, beauty blog or entertain blog. You can get this free premium blogger template easily by clicking the download button and skip the ads. About Me, Breadcrumbs, Browser Compatibility, Customizable, Drop Down Menu, Email Subscription Widget Ready, Featured Post, Girly, Mobile Friendly, Page Navigation Menu, Photo Profile, Responsive, SEO Friendly, Social Share Button, Clean, Elegant, Unique, 1 Right Sidebar, White, Orange, 2 Columns, No Column Footer. Beauty blogger template, Fashion blogger template, Food blogger template, Lifestyle blogger template, OOTD blogger template, Personal blogger template, Photo blogger template, Profile blogger template, Recipes blogger template, Reviews blogger template, Travel blogger template, Viral blogger template, Wallpaper blogger template, Retina blogger template.